Camping L’Oasis campsite is the perfect holiday location for families looking for the ideal balance between great activities and great location. Occupying over 9 hectares of grounds, this lovely, 4 star, family friendly campsite benefits from some wonderful landscaping. A smashing variety of colourful plants, flowers and palm tress offers not only shade and privacy but also gives you a real tropical paradise feeling. The nearby seaside resort of Le Barcares is walkable from the campsite in around 20 minutes and is home to some wonderful French restaurants and bars which sell locally sourced food and drink. You’ll also find some great weekly markets in the town which sell a variety of food, drink and goods. The nearest beach to Camping L’Oasis is around 1.5km away at Le Barcares. Wide, long and covered in soft golden sand, the beach is fantastic place for families with lots of space to spread out and enjoy the variety of activities on offer. Swimming, sunbathing, building sandcastle or playing games, you’re sure to have a fantastic time. The beach is backed by a promenade and you’ll find plenty of car parking nearby should you not want to walk the 20 minute distance. 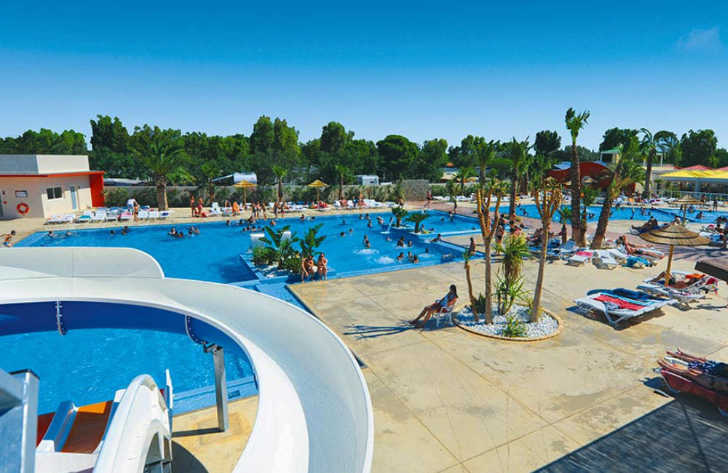 If you love swimming pools then you’ll love the pool complex at Camping L’Oasis. Recently renovated, the swimming pool complex covers an area of 3200m2 and its impressive facilities cannot fail to impress. A beautiful sun terraced area where you can sit back, sunbathe and relax, a large heated family pool, children’s pool and variety of slides await you at the fabulous Camping L’Oasis. Camping L’Oasis campsite offers a comprehensive selection of activities and facilities on site and also nearby to ensure you have a fantastic family holiday. On-site activities at Camping L’Oasis campsite include a multisports area, rifle shooting, boules, tennis, basketball, football, volleyball, diving, gym, tennis, table tennis, playground and cycle hire. Facilities available at Camping L’Oasis campsite include WIFI, restaurant, pizzeria, snack bar, takeaway, bar, groceries, animation team, games room, washers and dryers. Accommodation at Camping L’Oasis campsite includes a range of 2 and 3 bedroom mobile homes that are available from Suncamp.